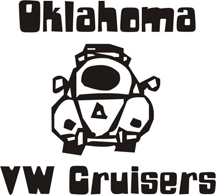 Oklahoma Vw Cruisers • BUG's out the Wazoo!!! This mulitple sighting all took place on Friday between 2:45 and 3:15pm (1445 & 1515 hundred hours for us military types). 1st one was a Chocolate----mmm Chocolate---(sorry got side tracked) Brown Super I passed going east bound on the 40 crosstown around the Western/Sheridan exit, Letter #2 was west bound on the 40 just passed the Fort Smith Junction it was a Black---mmmm Dark Chocolate--- late model standard, and to cap the Trifecta an early standard was going north on Sooner it was close to the same color green ---mmmmm Mint Chocolate--- as Jim's STP (speaking of Jim's STP any progress on it's return to the Oklahoma Highways). So it was a wonderful day of "Car Spotting".